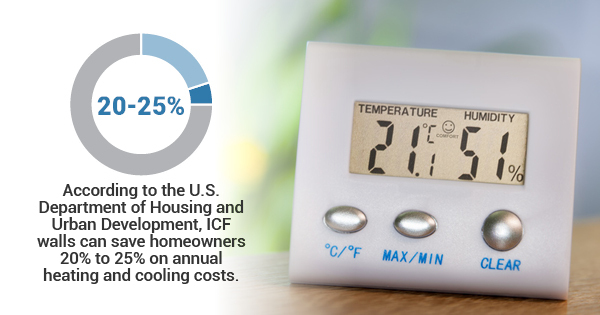 According to the U.S. Department of Housing and Urban Development, ICF walls can save homeowners 20% to 25% on annual heating and cooling costs. And in addition to being installed around your home’s foundation, insulated concrete forms have a wide range of benefits when used in the construction of garage spaces. If you’re considering increasing the value and durability of your home’s garage through Nexcem ICF installation, here are just a few of the many benefits you should expect. You can expect increased energy-efficiency with Nexcem ICFs regardless of their specific application. But it’s a particularly advantageous talking point in garage applications because of the lack of insulation that’s usually there beforehand. Nexcem ICFs are built with sustainability in mind every step of the way, and when it comes to their uses with garages, homeowners simply can’t go wrong. After installing Nexcem ICFs in your garage, you should notice a virtually instant increase in efficiency and a drastic drop in monthly heating and cooling expenses. Another point that’s especially useful with Nexcem ICF garage applications is the material’s natural resistance to moisture. It’s not uncommon for moisture and water to cause damage to an ordinary garage, but with the resistance of Nexcem ICFs, you can expect your garage to be able to withstand even the most severe conditions. In fact, buildings constructed with ICF are six to nine times stronger than traditional buildings. Plus, ICF construction is capable of protecting properties from natural disasters because they’re capable of withstanding 402 kph winds. Finally, you’ll be pleased to hear that Nexcem ICFs are quite versatile and customizable if you feel that the layout of your garage needs a new look. Just ask your ICF contractor about the best ways to arrange your ICFs in a way that makes them easy to rearrange if you need to repurpose your garage. ICFs definitely offer more versatility in terms of rearrangements and overall customizable options. ICF systems have been used in global construction for over 60 years, and understanding these benefits can help you choose the best application for ICFs based on your home’s infrastructural needs. For more information about insulated concrete forms, contact Nexcem.